About the Book: When The Silver Locket opens, it’s July 1941 in Boston, Massachusetts. War is raging in Europe and the Pacific. But for two young women in a small town in New England waging their own personal battles, the struggle is way too close to home. When extraordinary circumstances bring these two women together, one decision will alter the course of their lives. And with that one decision, their lives will be forever changed…and forever intertwined. Were these two women thrust together by happenstance—or fate? A tragedy. A decision. A pact. Lives irretrievably changed. A baby girl will grow up in the shadow of a secret that must be kept at all costs. But will this secret ever see the light of day? And what happens when—or if—a promise made must be broken? A sweeping and suspenseful story that unfolds in a different time and a different place, The Silver Locket explores universal themes that ring true even today. Secrets. Unbreakable bonds. The healing power of love. Deception. Anguish. Redemption. In this touching and tender tale, novelist Sophia Bar-Lev weaves a confident, quietly moving story about adoption, finding hope in the face of hopelessness, and how true love can overcome any obstacle. With its brilliant juxtaposition of the wars fought both on the battlefield and internally, The Silver Locket is a poignant novel, resplendent with drama. 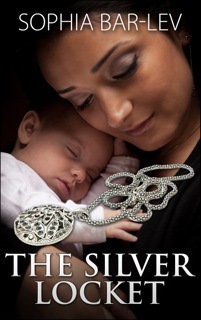 Featuring an exceedingly real and relatable plot, and characters that will stay with readers long after the final page is turned, The Silver Locket is a sterling new read. It was over in less than four minutes. She lay motionless, zombie-like. He laughed. He laughed…looking down his nose at her, his steel blue eyes boring into her very soul. Snickering, he turned away, grabbed her black bag and pounded across the tarmac, disappearing into the imposing residence barely a hundred and fifty yards away. Shadows danced grotesquely on its façade, as if paying homage to sinister forces within the darkened mansion. She was numb, half-dead. Night breezes stirred the leaves above her head. They moved; she didn’t. Shredded bits of fabric swirled about, brushing across her face, lifting off, floating back down, teasing her, nudging her to get up and walk away. A full hour passed; a full hour of her life stolen by shock – by crippling, deadening, devastating shock. Suddenly a wail pierced the quiet. It crescendoed into a howl, and just as quickly receded into deep, forceful sobs. Ten minutes passed, then twenty, then thirty. Finally, drained and spent, she rolled onto her side and with difficulty, stood to her feet. She felt pain but chose to ignore it. Disoriented, she searched her immediate surroundings for something familiar. The darkness gave up no clue but her mind came to the rescue. She took a few steps. “I’m so proud of you, darling,” her Dad had whispered as he led her down the aisle three years ago. Why are such thoughts coming up in my mind now? She shook her head violently. Approaching headlights distracted her. Startled into reality, she pulled her torn dress close, her eyes darting around for a tree, a shrub, any place to hide. The car slowed and a kindly voice called to her. “Do you need a ride, Miss?” The white-haired driver had rolled down the window and getting out of the car he added, “It’s awfully late for you to be out walking by yourself, isn’t it?” He made his way to the other side and opened the passenger door. “Where do you need to go?” he asked. The moon broke through the clouds at that precise moment and illuminated the bloody, dress and dirt-streaked face. He gasped. She pulled back. Biting her lip, she shook her head back and forth but said nothing. He paused where he stood, uncertain, confused. “Shall I take you to the hospital?” he asked softly.